Are you using strategic packaging to drive cost savings? If you’re still purchasing everything available in commercial unit-dose and repackaging the remaining bulk medications in-house, chances are you’re missing out on significant cost savings. When you start to think about all of the expenses that come with in-house packaging — equipment, maintenance, materials and labor (to name a few) — the cost really starts to add up. 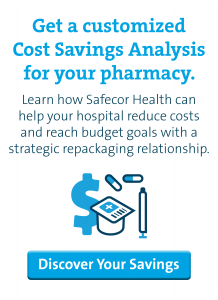 Safecor Health has helped numerous customers capture significant annual cost savings without additional labor or incremental packaging costs. The pre-populated information is an estimate based on our experience with the selected bed range. Please confirm your email so we can send you a copy of your estimated savings! *Based on numerous studies performed for our customers. Individual hospital savings can vary based on formulary, usage, purchasing practices, wholesaler and GPO.